Eraquell contains the active ingredient ivermectin which kills more roundworms and bots than any other worming ingredient including large redworms. Effective against small redworms, pinworms, large roundworms, threadworms and hairworms. Eraquell plays an important part in your strategic worming programme, providing unsurpassed control of worms during summer grazing. Waiting days meat 30 days. Ivermectin belongs to the family of avermectins, which are obtained by fermentation of Streptomyces avermitilis. It is effective against nematodes (roundworms) and arthropods (arthropods) by inhibiting the transmission of impulses between nerve cells or between nerve and muscle cells. The parasites are paralyzed and eventually die off. Ivermectin does not work against flukes and tapeworms. Eraquell wormer is intended for oral use. 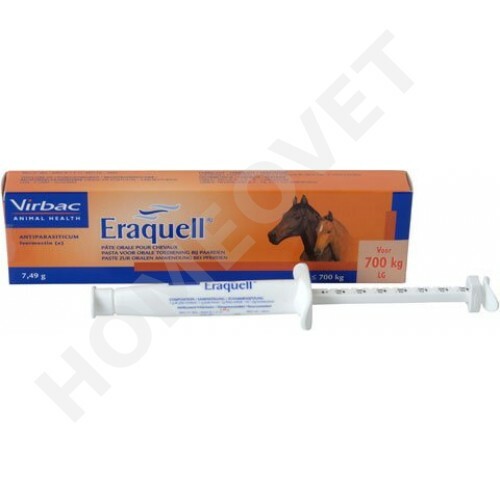 Eraquell paste can be administered to pregnant and lactating mares, the reproductive performance of stallions is not adversely affected. Do not use in foals less than 2 weeks. Mares, whose milk is intended for human consumption shall be excluded from treatment.